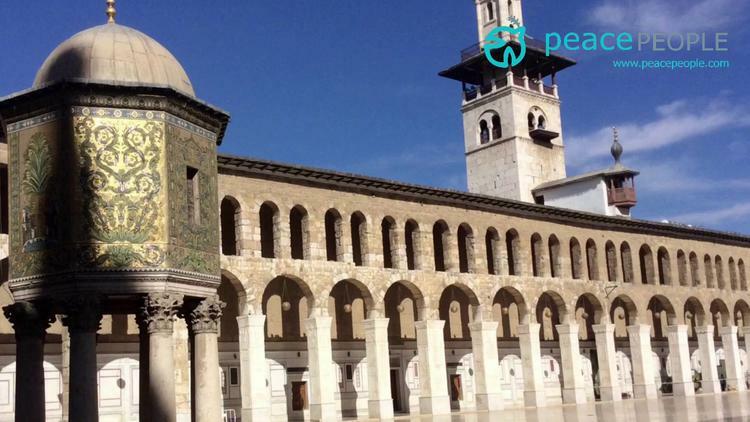 BELFAST (IPS) – In November 2015 I visited Syria together with an International Peace delegation. This was my third visit to Syria in the last three years. As on previous occasions I was moved by the spirit of resilience and courage of the people of Syria. In spite of the fact that for the last five years their country has been plunged into war by outside forces the vast majority of the Syrian people continue to go about their daily lives and many have dedicated themselves to working for peace and reconciliation and the unity of their beloved Syria. They struggle to overcome their fear, that Syria will be driven by outside interference and destructive forces within, to suffer the same terrible fate of Iraq, Afghanistan, Ukraine, Yemen, and so many other countries. Many Syrians are traumatized and in shock and ask ‘how did this happen to our country’? Proxy wars are something they thought only happened in other countries, but now Syria too has been turned into a war-ground in the geo-political landscape controlled by the western global elite and their allies in the Middle East. Many of those we met were quick to tell us Syria is not experiencing civil war but a foreign invasion. To tell us too that this is not a religious conflict between Christians and Muslims who, in the words of the Patriarch Gregorios III Laham ‘Muslims and Christians not only dialogue with each other but their roots are inter-twined with each other as they have lived together over 1436 years without wars, despite disagreements and conflicts…over the years peace and co-existence have outweighed controversy.’ In Syria our delegation saw that Christian and Muslim relationships can be more than mutual tolerance, they can be deeply loving. During our visit we met hundreds of people, local and national political leaders, government and opposition figures, local and national Muslim and Christian leaders, members of reconciliation committees and internally displaced refugees. We also met numerous people on the streets of town and cities, Sunni Shia, Christian, Alawite, all of whom feel that their voices are ignored and under-represented in the West. The youth expressed the desire to see a new state which will guarantee equality of citizenship and religious freedom to all religious and ethnic groups, and protection of minorities, and said this was the work of the Syrian people, not outside forces, and could be done peacefully. We met many Syrians who reject all the violence and are working for conflict resolution through negotiation and implementation of a democratic process. Few Syrians we met were under the illusion that their elected (7O percent) leader President Assad, was perfect yet many admired him and felt he was much preferred to the alternative of the government falling into the hands of the Jihadists fighters, fundamental extremists with ideology that would force the minorities (and moderate Sunnis) to flee Syria (or many to get killed). This had already been experienced with the exodus of thousands of Syrians, when they fled in fear of being killed or homes destroyed by jihadist foreign fighters, and alleged moderates, trained funded and accommodated by outside forces. In Homs we witnessed the bombed out houses when thousands fled after Syrian rebels attacked Syrian forces from residential areas, and the military responded causing lethal damage to civilians and buildings (the rebel strategy of Human Shields) and they also done the same with cultural sites (cultural shields). In the old city of Homs we had a meeting with members of the reconciliation committee, which is led by a priest and sheikh. We also visited the grave of a Jesuit priest who was murdered by IS fighters and visited the rebuilt Catholic church, the original of which was burned down. During the meeting by candlelight, because of regular power blackouts, we heard how Christians and Muslims in the town had been instrumental in the rehabilitation of fighters who choose to lay down their arms and accept the Syrian Government’s offer of Amnesty. They appealed to us to ask the international community to end the war on Syria, and support peace, and it was for our delegation particularly sad and disappointing that that very day the Anglican Archbishop of Canterbury, (UK), publicity announced his support for the UK vote to bomb Syria! (And subsequently the UK Government, voted for War on Syria). (If the UK/USA/EU, etc., wish to help the Syrian people they can immediately lift the sanctions which are causing great hardship to the Syrian people). We also visited the Christian Town of Maaloula, where Aramaic, the language of Jesus, is still spoken and it is one of the oldest Christian towns in the Middle East. We visited the church of St. George and the priest explained how after their church was burned to the ground by western backed rebels, and many Christians killed, the people of Maaloula, carried a table onto the ruins of the church and after praying started to rebuild their church and homes. Sadly also in this place some Muslim neighbours also destroyed Christian neighbours’ homes and this reminded us all of the complexities of the Syrian conflict and the need to teach nonviolence and build peace and reconciliation. It also brought us to a deeper awareness of the plight of not only moderate Sunnis from extremists, but the huge numbers of Christians now fleeing from Middle Eastern countries, and that if the situation is not stabilized in Syria and the Middle East, there will be few Christians in what is called the cradle of civilization and birth of Christianity, and where the followers of the three Abrahamic faiths have lived and worked as brothers and sisters in unity. The Middle East has already witnessed the tragic and virtual disappearance of Judaism, and this tragedy is happening at an alarming rate to the Christians of the Levant. But there is hope and Syria is a light to the world as there are many people working for peace and reconciliation, dialogue and negotiations, and this is where the hopes lies and what we can all support by rejecting violence and war in Syria, the Middle East and our world.